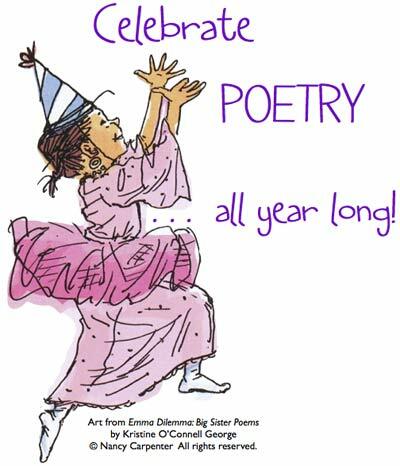 44+ Ways to Celebrate Chiildren's Poetry | All year long! Poetry is meant to be read aloud. Read poems to children, your neighbor, yourself. Visit Poetry Aloud! to hear some of my poems. Hear poems read aloud at The Favorite Poem Project. Listen to (and record!) some poems at The Poetry Foundation's Record-a-Poem project. The original definition of anthology is "a gathering of flowers." Have students compile either classroom or individual anthologies of favorite poems. This project will be even more meaningful if students write a personal introduction explaining their theme and why they chose particular poems. (The introductions Naomi Shihab Nye has written for her various anthologies would be good models for upper-grade students.) Don't forget illustrations! Use push pins on a world map to locate the origin of poets students have read or studied. Read and write poems about balloons. Send students home with a poem inside (or outside!) a balloon to share with family members. Keep a basket of poems handy in classrooms, libraries, or bookstores for quiet times. Several years ago, sixty billboards in the Los Angeles area featured something new—lines of poetry instead of advertising! Students could adapt this idea and place "poetry billboards" (anonymously, of course—that would be half the fun!) around the school, library or bookstore. Gather young "campers" and build a virtual bonfire. Share poems about the outdoors. Help young writers organize a club that meets regularly to share and write poetry. Great sites to host poetry clubs: school libraries, community libraries, and bookstores. Organize a poetry reading complete with microphone and hot cocoa. Great sites for poetry readings: schools, libraries, and bookstores. Serve cookies and poems. Thanks to head librarian, Sally Hilliard, River Oaks Baptist students discovered cookie poems in the cafeteria. Wrap individual poems as gifts and have a gift exchange. Fold an origami creature and write a poem on your creation. Display or give as a gift. See Fold Me a Poem for directions. 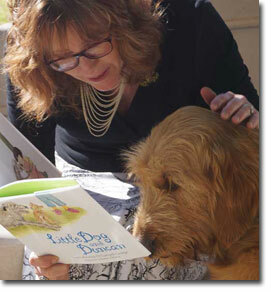 Invite a pooch (or cat, guinea pig, iguana....) to school for a poetry reading. Have children write poems to/for their pets. There's something special about listening to poetry in the dark. Dim the lights then read poems about candles, flashlights, stars, or even that crack of light beneath the bedroom door. See Flashlight Poems in the Teachers' Guide for TOASTING MARSHMALLOWS: Camping Poems. Fill a shopping bag full of old hats. Let every child choose a hat. Read "A Flower Pot is Not a Hat" by Martha Moffett, "Ho for a Hat" by William Jay Smith, and "The Quangle Wangle's Hat" by Edward Lear. Use rain hats, fur hats, sports caps, straw sun hats, etc. as props. Invite a local poet (or poetry-loving dignitary) from your town to share their favorite poetry. There is nothing like a "live" reading! Encourage students to record their favorite poems for the Listening Center. See Poetry Aloud for audio clips of poems. Favorite poems are laminated and posted with Velcro™ at a "child's-eye" level outside Shoshy Starr's Lilja School classroom in Natick, MA. Students from other classes stop to read and are welcome to "borrow" poems to share with friends and classmates. Learn a poem by heart! Older students can write original nursery rhymes and make a book to share with Kindergarten classes. Spread the checkered tablecloth and read poems about picnics, ants, sandwiches, lemonade, etc. Have students carry (and be prepared to share) a poem on a specific day. Students visiting a library or bookstore who have a "poem in their pocket" could be presented with a small gift such as a bookmark. Student groups in Barren County Middle School, in Glasgow, Kentucky memorized a poem and prepared for a performance using props and costumes. On the day of the "poetry trail" student groups were posted across campus. As students followed the "poetry trial" they stopped at each group to hear the poem performed such as the student group playing basketball who performed a poem about basketball. Tie your students' poems to the branches of a tree. Display your "poet-tree" during Arbor Day or Earth Day. Write a Tree-ific Poem to your favorite tree. See OLD ELM SPEAKS TREE POEMS. Cut out or draw pictures of animals and find a poem about each animal. Arrange poems and pictures on a bulletin board for a catchy display. Students mail poems to their classmates or exchange poems with another class. Random Acts of Poetry is just one of many creative ways librarians Gail Bush and Andrea Hynes connect students and school staff to poetry! Share a poem you love with a student, fellow teacher, your family. Build a display of ordinary items featured in poems—balloons, kites, monkey wrenches, paperclips, shoes—have students find poems featuring the objects. Take students on a poetry scavenger hunt through books, signs, instruction manuals, etc. Their mission: To find the poems hidden in text. See Georgia Heard's anthology, The Arrow Finds Its Mark: A Book of Found Poems to get started. Have students find and share poems that a secret pal would enjoy based on the pal's interests. Check out this link for everything you'll need to plan a successful event for a community, school, library, or bookstore: Favorite Poem Project. Students decorate T-shirts with lines of poetry or names of poets. A few simple "props" such as a cape, hat, mask, etc., can spice up a poetry reading. Poetry Bulletin Boards Get inspired! Poetry Power More poetry teaching ideas and links. Got a great idea? Share it!